Installing a roof rack, Luggage Racks, Cargo Baskets and Bags to your car, truck, SUV or mini van allows you to easily carry additional luggage without cramping the inside of your vehicle for those long trips. We have roof cargo bags that are water proof and even have a special felt bottom to prevent scratching to your vehicles paint. Our Safari roof rack mounts to your existing roof rails and is made of a black tubular construction with stainless steel side plates for superior quality and durability. We also carry a wide range of cargo storage organizer to help keep your gear secure and out of the way. If you have any questions regarding any of our roof racks, cargo bags, cargo storage organizer’s, please give us a call at 1-713-941-1391. Roof racks provide the freedom to take anything you want along for your next trip. Freeing up interior space, a roof rack also provides more room for the comfort of your passengers. And, our roof racks mount fast to virtually any vehicle. The Aerodynamic roof rack storage Carriers & bags are available in a waterproof or a water resistant design. The aerodynamic cargo carrier storage bags come diffrent sizes. Roof rack cargo storage bags are designed for the safe and dry transport of your gear on top of your vehicle's roof rack. Cargo Rack Mounting Methods; Fixed Mount, which offers a universal fit to almost all vehicles and truck shells. Track Mount, allowing the cross bars on the track to be easily repositioned for cargo needs, an O.E. Rail Mount, made specifically for the O.E. rail utilizing the vehicle’s existing rails to mount the crossbars. Ordering is simple since Westin’s Sport-Series Roof Racks are sold in complete kits. Crossbars, support legs and hardware are all included and feature a key lock system to secure your precious cargo. 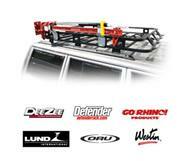 Roof rack accessories further improve the utility of your vehicle's roof rack. Whether it's a place for your bike, light mounts, ski and snowboard carriers these roof rack accessories bring your rack to life. Plus, our roof rack accessories are custom-made for your rack.